One of the news items this week is that the Perth Mint created the “Discovery” coin, a 2-kilogram (4.4 pounds) gold coin with rare pink diamonds that depicts the discovery of Austrailia and the mining culture that grew on the island nation. 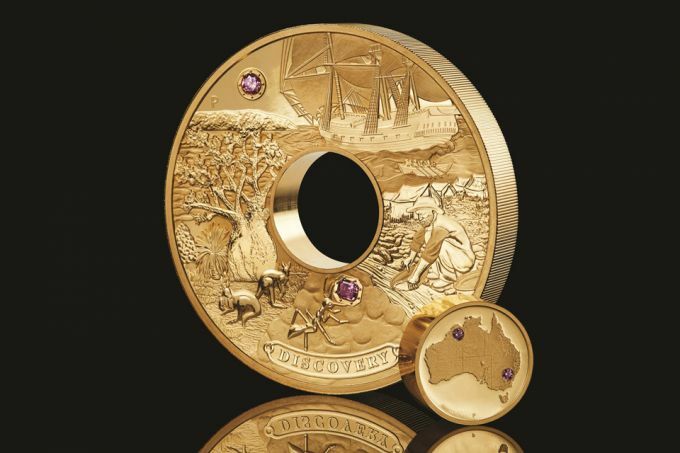 Modeled after the Holey Dollar, Australia’s first coin, it features four 1.02 karat pink diamonds mined in Western Australia. The center of the holey coin is included as part of the set. For the record, the coin as a reeded edge. Perth Mint officials said that the coin, worth A$2.48 million (US$1.76 million), was created to “meet growing demand for high-end collectables from the ultra-rich.” It will be sold at auction with expectations that the buyer will be from Asia or the Middle East. This is not the first time the Perth Mint has made a gimmick coin. In 2011, they created the Australian Kangaroo One Tonne Gold Coin. The coin was made using one metric tonne (2204.62 pounds) of .9999 fine gold, the coin measured 80 centimeters (31.5 inches) in diameter and 12 cm (4.72 inches) thick. Also with a reeded edge. What is the point of making a coin like this? Aside from extracting money from someone whose pocketbook can match his ego, is there a good reason to make these coins? Of all of the questions as to whether what the U.S. Mint does is good for the hobby, where does this gimmick rank in comparison? > Wikipedia: A coin is a small, flat, (usually) round piece of metal or plastic used primarily as a medium of exchange or legal tender. They are standardized in weight, and produced in large quantities at a mint in order to facilitate trade. They are most often issued by a government. – metal or plastic YES! – issued by government YES! Here’s the giveaway word; ‘collectables’. Nope, its not a coin. The only correction I will make is that it is a legal tender coin in Australia. Other than that, you are correct! However, it brings up an interesting question: What about the 5-ounce silver America the Beautiful Quarters? Or the American Eagles? I think the phrase ‘to facilitate trade’ is a vital one. Being a Brit I’ll have to give a UK example: back in 1900 a gold sovereign would be deemed a coin – albeit a valuable one – and you would exchange one or more for services, goods, etc.. In 2018 a gold sovereign is an investment – it’s beautiful bullion, but still bullion. I think American Eagles fall into the same category. I don’t see them as facilitating trade, they’re more wealth storage. Significant portable wealth even, like pre-bank coins, so there is definitely a link back to the days of yore. However, I’ve yet to see a modern purse with a few loose sovereigns in there. But it would be sweet!